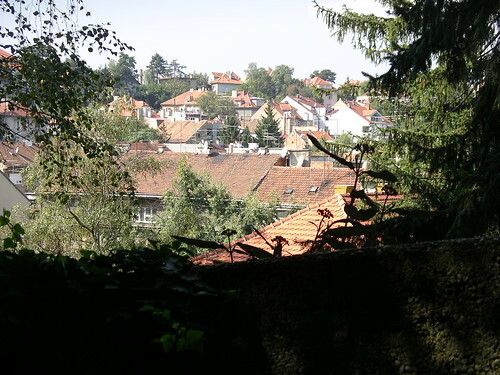 When I came to Zagreb, and to Croatia, for the 1st time, I had just lived in Norway for a year. Norway, the country whose language I had spent 3 years at university to learn, whose history I know better than my own country’s, whose culture I had been so curious to experience live. Norway, whose national dish, I quickly discovered, is the Grandiosa, a frozen pizza with a fake Italian name. For most Norwegians, the less time you spend in the kitchen the better. For someone with a taste for cooking and eating in general, this was an extreme disappointment. Another source of despair was that it is hard to find good produce to cook with: in Norway, most of the vegetables are imported, often from the Dutch glass houses. As a result, tomatoes remain desperately firm, tasteless and of the palest red all year long. What I missed most were the wonderful spring vegetables and fruits, to the point that I remember going back to Norway from a short stay at my parents’ in France in June with a kilo of shelled broad beans in my backpack. For a short while in July, one can find big, shiny, red homegrown strawberries and cherries on the Bergen market, but their taste does not match their look. So can you imagine how happy I was when I arrived to Zagreb? I went to Dolac and instantly felt at home. I don’t think I had ever been to such a big vegetable market, and then there was the fish section, the meat section, the dairy section. 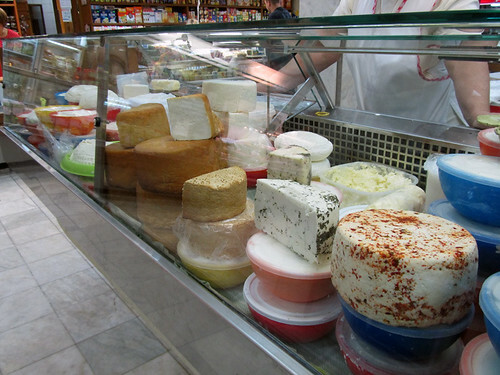 I was introduced to kajmak and to dimljeni sir, great substitutes for the crème fraîche and the salted butter I miss from home. But the thing I remember being most happy about was when I realized, the following spring, that all the wooden stalls that suddenly popped up at every street corners where selling strawberries. 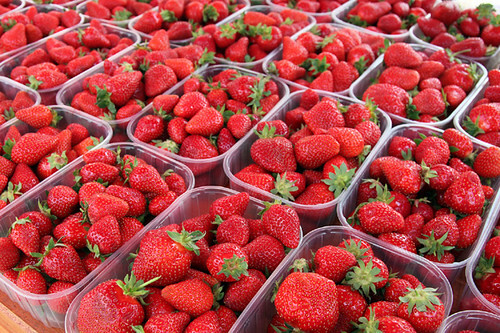 Heaps of fresh, locally grown, ripe, tasty and fragrant strawberries were available virtually everywhere. I biked around, surrounded by the smell of my favorite fruit. And that lasted for a whole month maybe more. A strawberry-smelling city? That’s a place where I could see myself living, definitely. 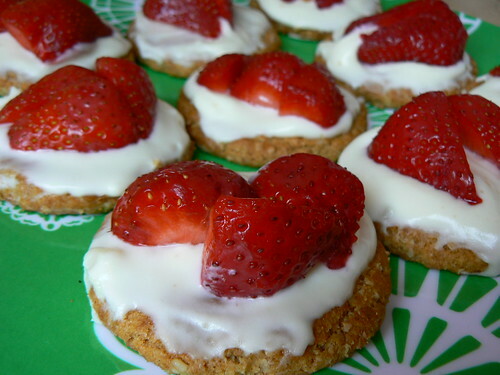 Now the recipe for Strawberry tartellettes or Tartelettes aux fraises. First of all, I have to give credit where credit is due: I got this recipe from my friend Mathilde, who made it for us along with a couple of other delicious dishes last time we had dinner at her place, but originally it comes from a French food magazine. It tastes delicious and it is easy to make, the two most important recipe criteria in my opinion. To make the crust, break 150 g of biscuits in thin crumbs, using a potato masher, a mortar, a rolling pin or your hands. They can be regular biscuits such as Petit Beurre or British digestive cereal biscuit like on the pictures. Pour 130 g of melted butter on the crumbs and mix well. Pack this mix tightly at the bottom of a dish (preferably glass or a springform pan if available) and put in the fridge. For a version that is friendlier to your heart (not entirely friendly, though, see the cream below :-), you can skip the butter and use the biscuits as the base to make mini pies instead of a big one. To make the cream, beat 250 g of mascarpone with 70 g of icing sugar and a pack of vanilla sugar, the fluffier the better. If the cream looks liquid, it’s normal, it thickens the longer it stays in the fridge. If you make a big pie, spread the cream over the crust in the dish and put back in the fridge for at least two hours before serving. Garnish with strawberry halves just before serving. If you make small pies, I think it’s better to wait a couple of hours until the cream has thickened before spreading it on the biscuits and adding strawberries, so that the cream doesn’t drip over the biscuits, making the pies look sloppy, and also to avoid the biscuit becoming too soft under the cream. The pies can basically be put together just before serving. Et voilà ! Čitamo se skoro na Manjadi!